Gooey Cinnamon Rolls with Cream Cheese Frosting | Rosetta Bakes! 1. To make dough, in the bowl of a mixer dissolve yeast in warm milk and let stand until foamy, about 10 minutes. Add the granulated sugar, eggs, flour and salt. Use the dough hook and knead on low-speed, adding a little more flour if needed, until the ingredients come together. Toss in the butter and continue to knead until the dough is smooth and springy, about 7 minutes. Form dough into a ball, put it in an oiled bowl and cover with plastic wrap. Let dough rise at room temperature until it doubles, about 1 and 1/2 hours to 2 hours. 2. Butter a 9-by-13-inch baking pan. Punch down dough and turn out onto a lightly floured work surface. Cut dough in half. Roll out one half of dough to a rectangle about 9-by-14 inches. Spread with half the butter (the other half will be used on the second half of dough), then sprinkle evenly with half of each brown sugar, cinnamon and zest. Starting at the long side closer to you, roll the rectangle tightly away from you, forming a log. press edges together to seal seam. Cut the long crosswise into 8 equal slices. Arrange slices, cut side down half of the prepared pan. Repeat with the remaining dough and filling ingredients and arrange slices n the other half of the pan. Cover pan loosely with plastic wrap and let stand in a warm, draft-free spot until puffy, about 1-2 hours, or refrigerate over night, then let stand 30 to 60 minutes before baking. 3. Position a rack in the middle of the oven and heat to 400 F. Brush rolls lightly with beaten egg wash. Bake rolls are golden brown and a toothpick inserted in one of the rolls comes out clean, 20 to 25 minutes. Let rolls cool slightly in a pan on a wire rack, then spread with cream cheese frosting while they are still warm. Makes 16 rolls. Cream butter and cream cheese well, add vanilla, then add confectioner sugar. Mix until creamy and smooth. Frost cinnamon rolls while still warm. Original Recipe from 2012 February issue of Ladies Home Journal. 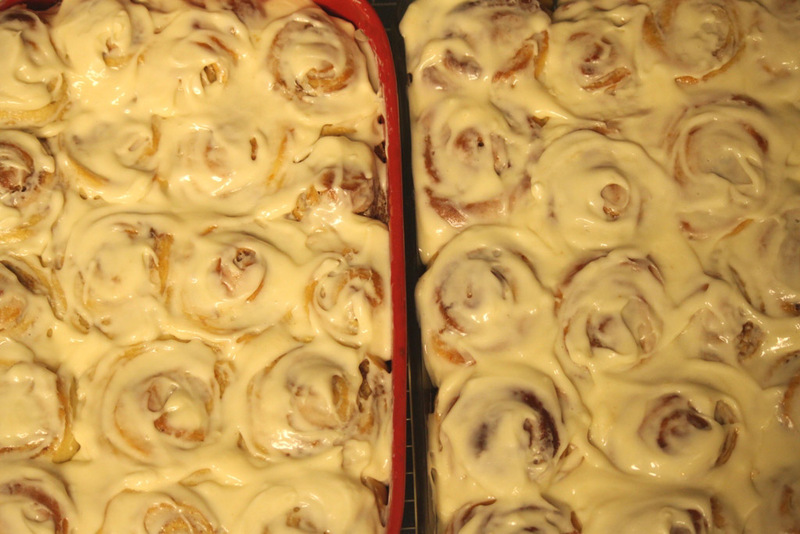 These look incredible…especially the amount of icing. My husband has had me looking for a whole wheat version of this recipe…any ideas? Thanks for sharing. Hi Shannon, Thanks for the compliment, this recipe is really good, I just started weight watchers last week and I saw a recipe on weight watcher’s website. I’ll be posting some low fat recipes soon. I did see a cinnamon roll version on weight watchers, but I’m not sure if it’s whole wheat. I’ll check it out on my lunch hour and get bacl to you. 1 to 2 Tablespoons milk if too thick.